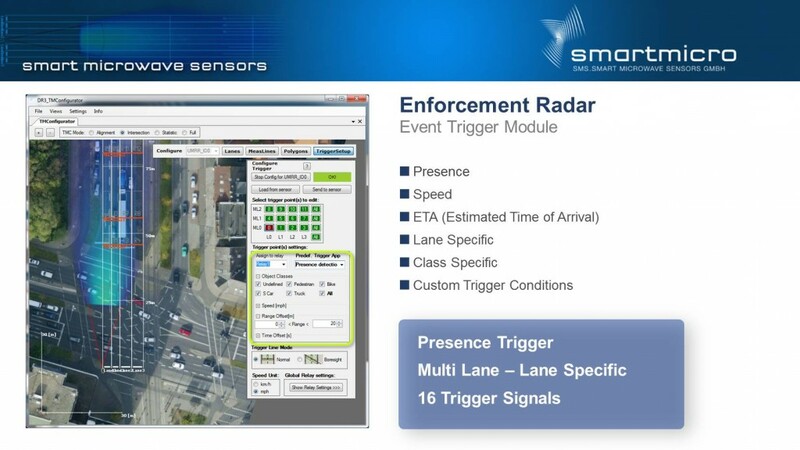 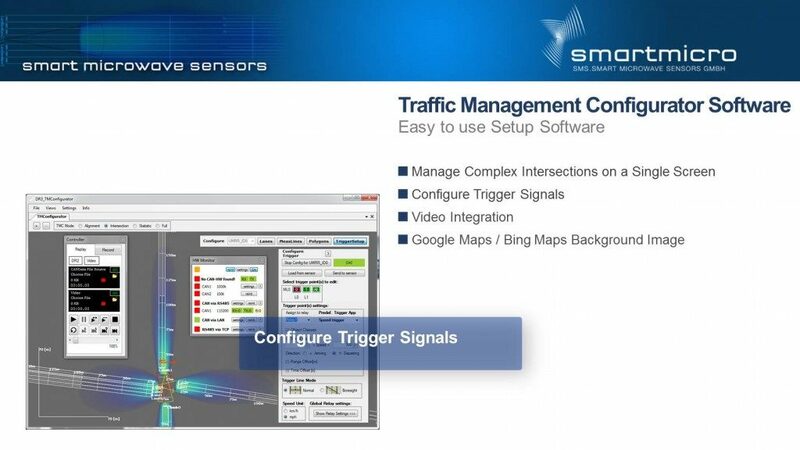 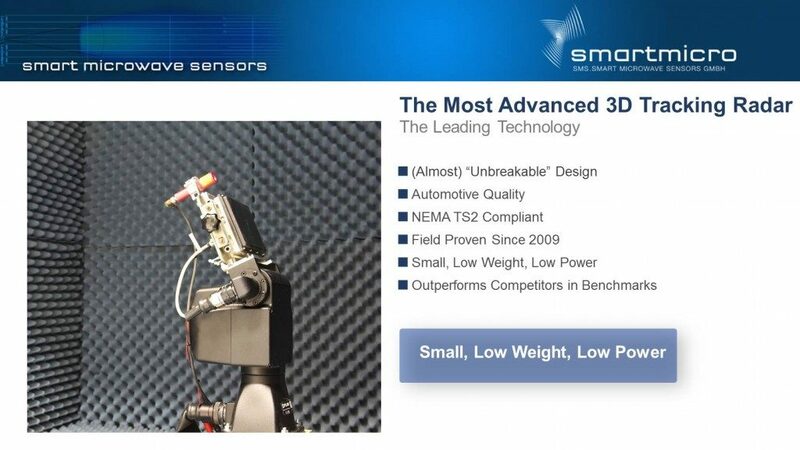 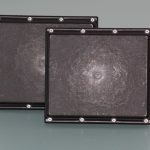 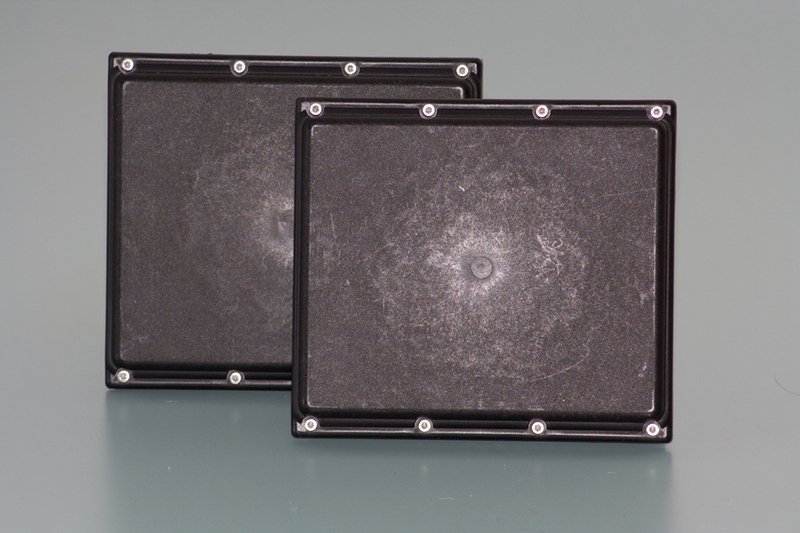 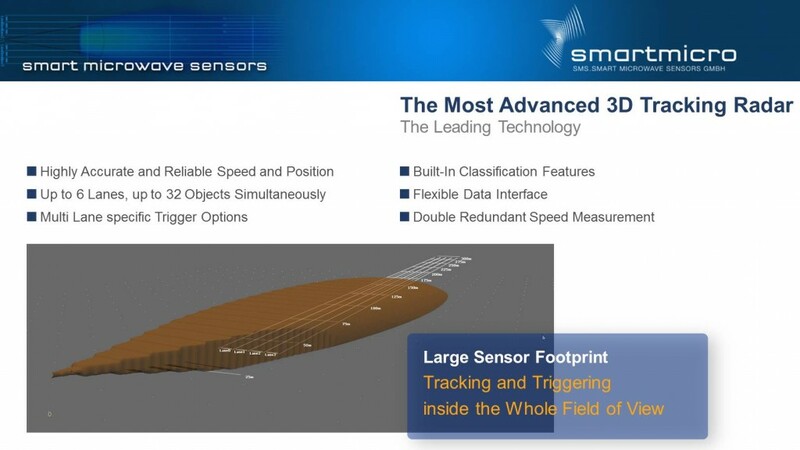 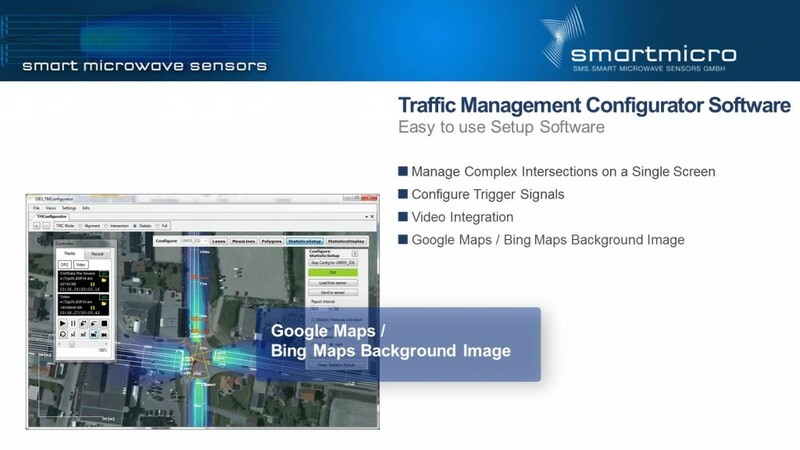 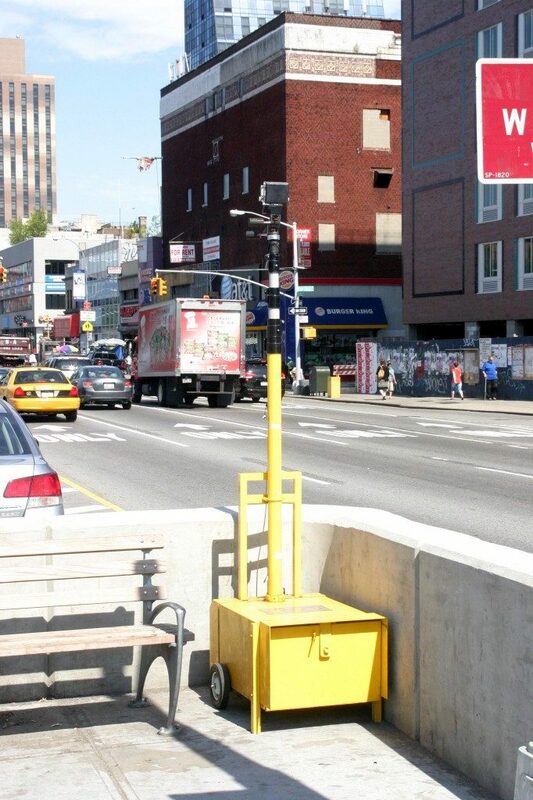 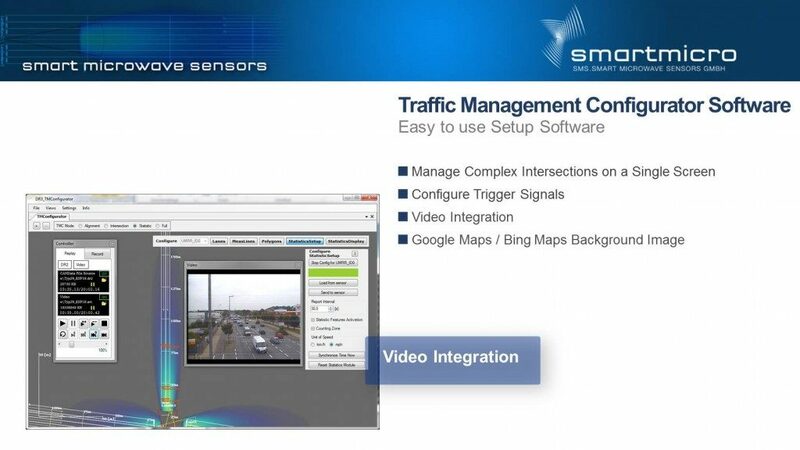 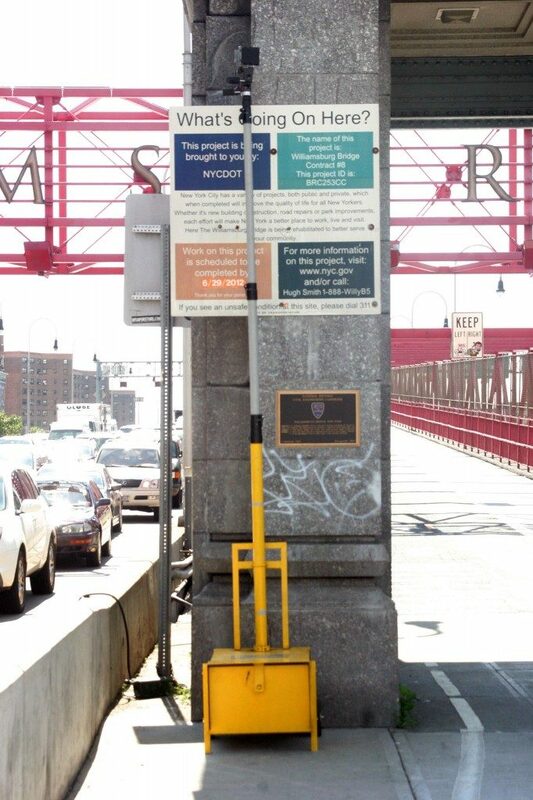 Smartmicro traffic sensors feature the most advanced 3D object tracking Radar technology available today. 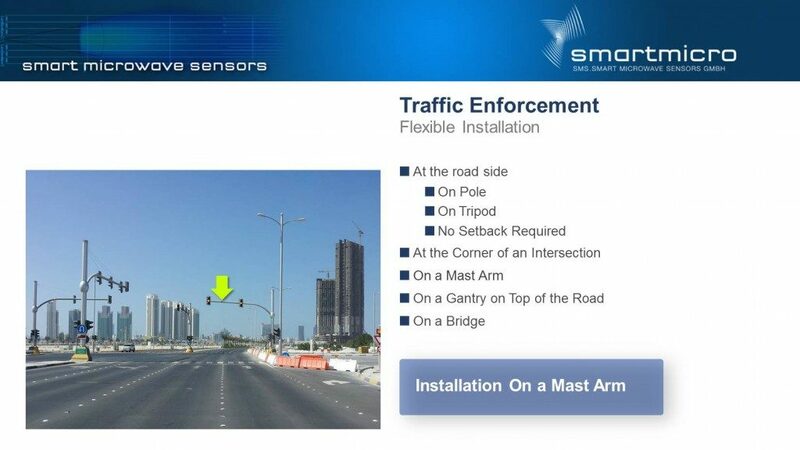 Products for intersection applications (stop bar and advance detection), road traffic management applications (counting and classification) and enforcement applications (speed and red light) are available. 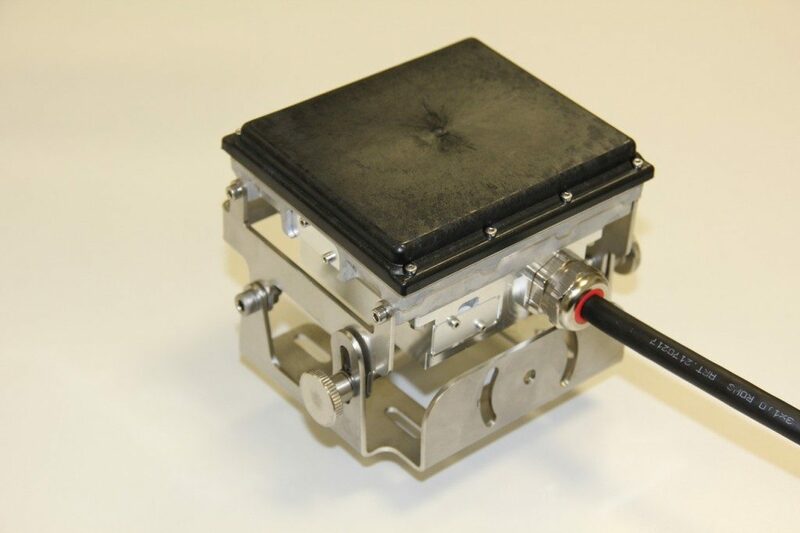 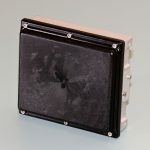 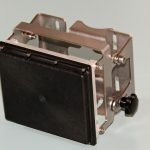 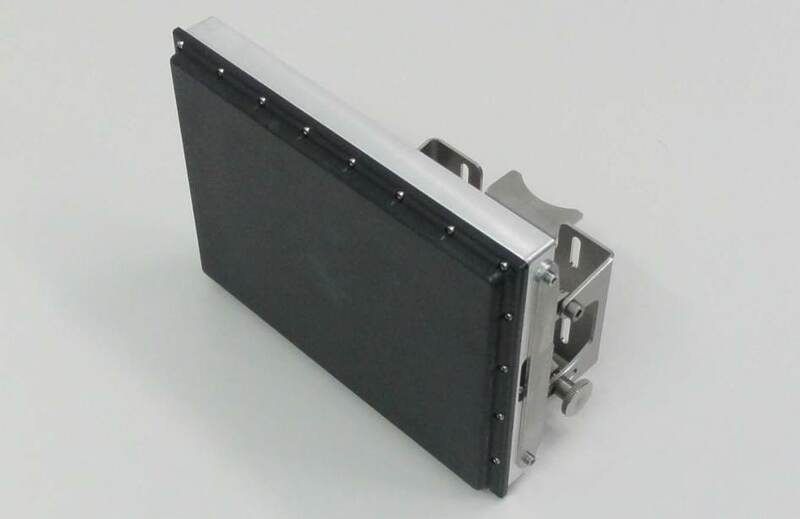 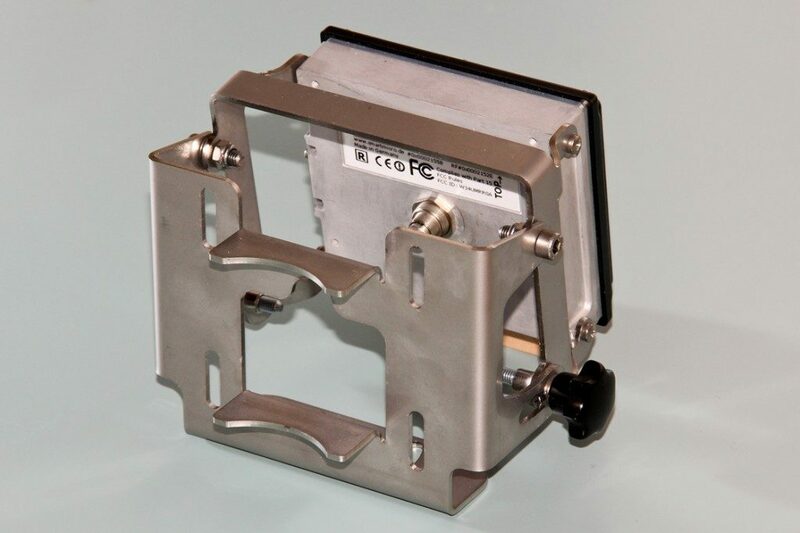 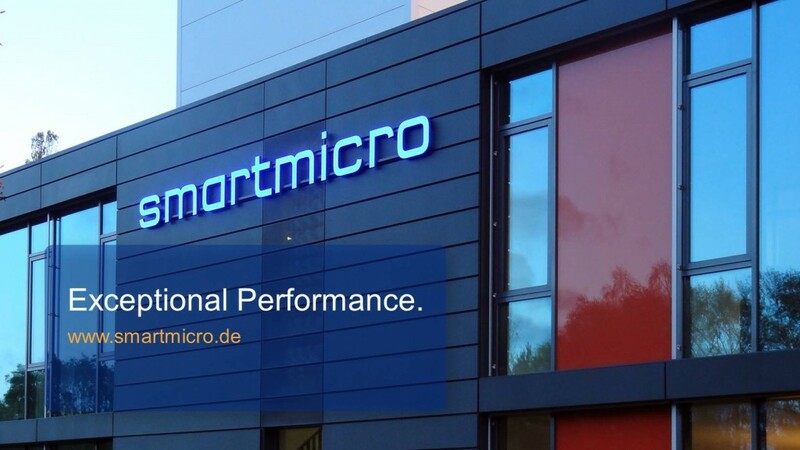 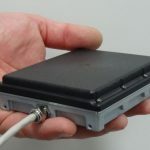 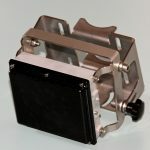 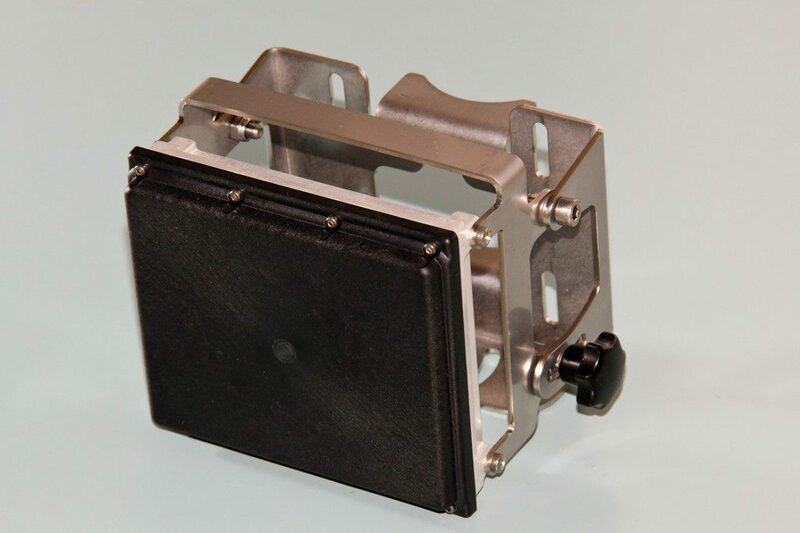 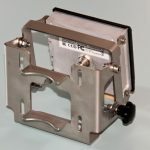 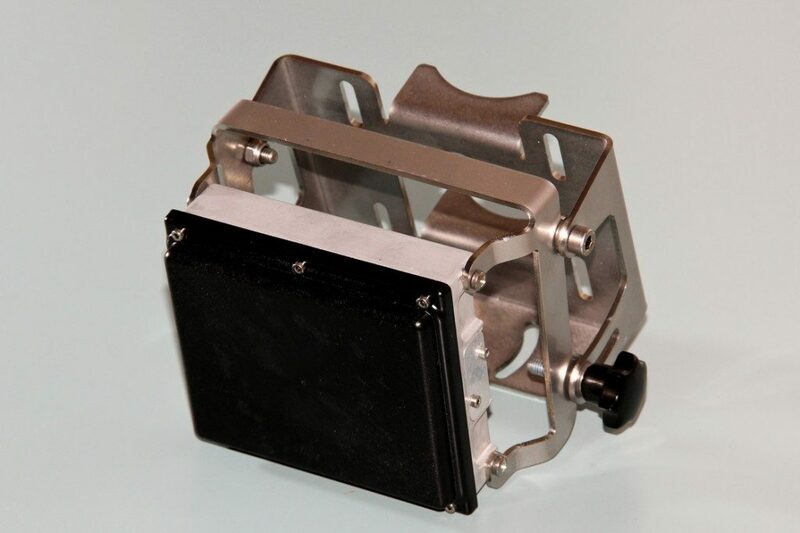 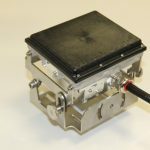 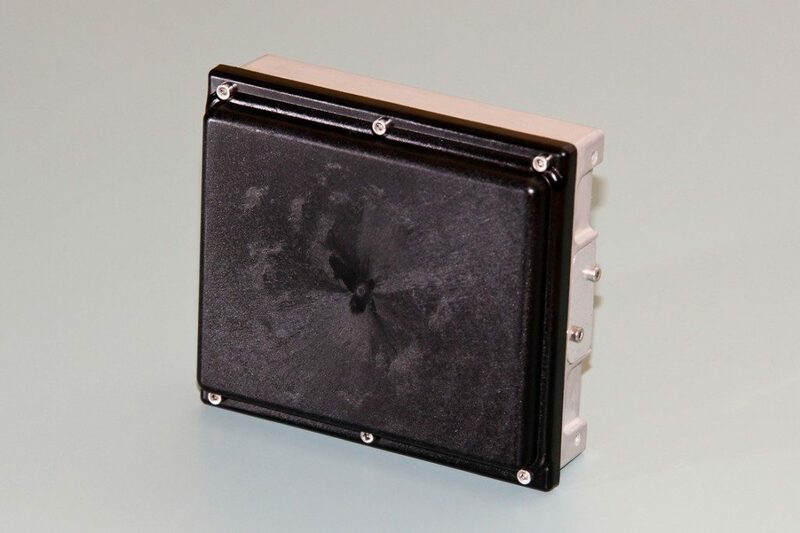 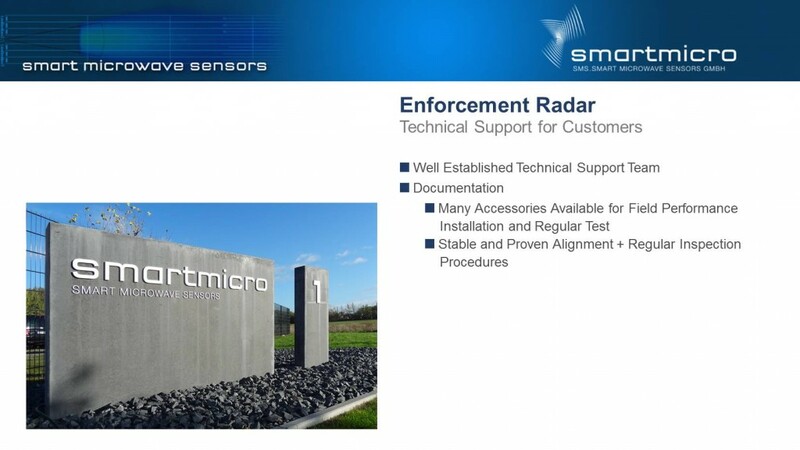 Smartmicro is supplying complete traffic solutions for end customers as well as sensors for OEM integration to numerous customers worldwide – many thousands of Radars being already deployed. 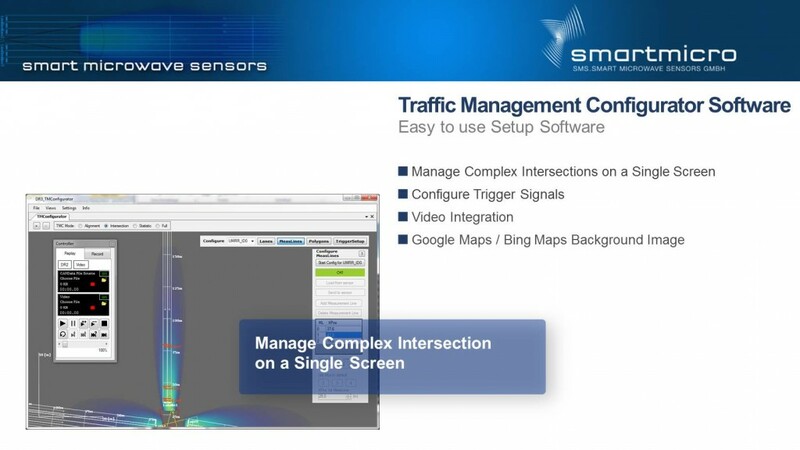 With more than five years of experience in the traffic sector, leading edge Radar technology and a constantly growing product portfolio Smartmicro is the perfect partner for traffic system providers and system integrators. 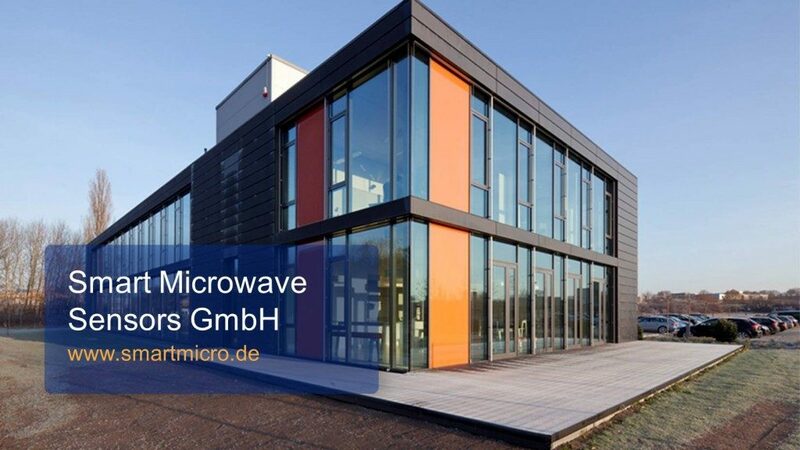 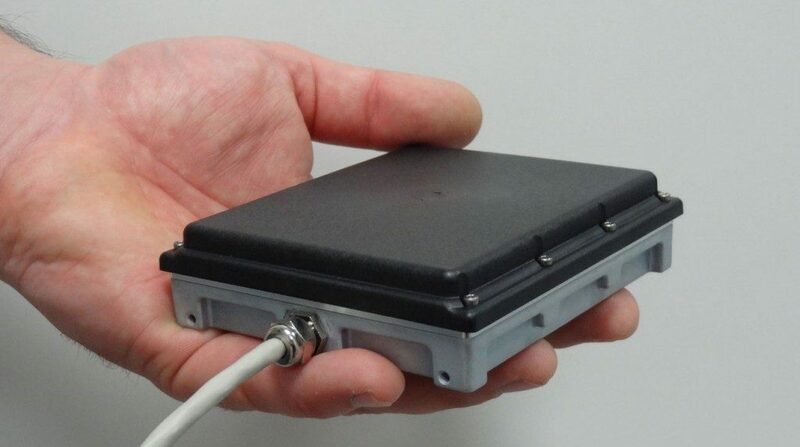 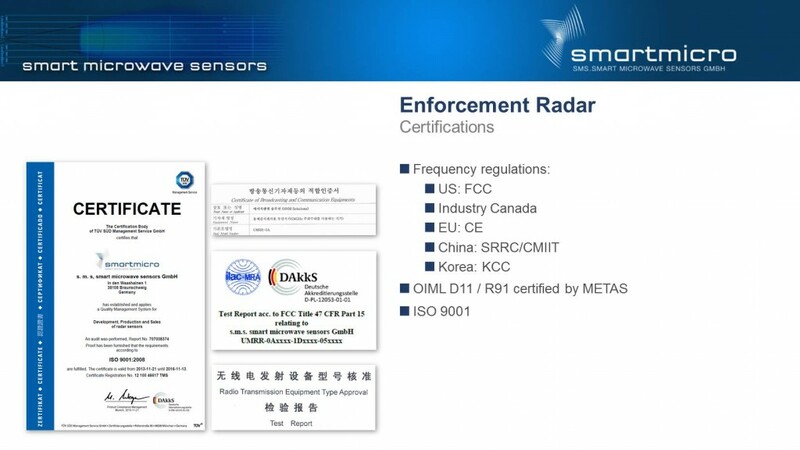 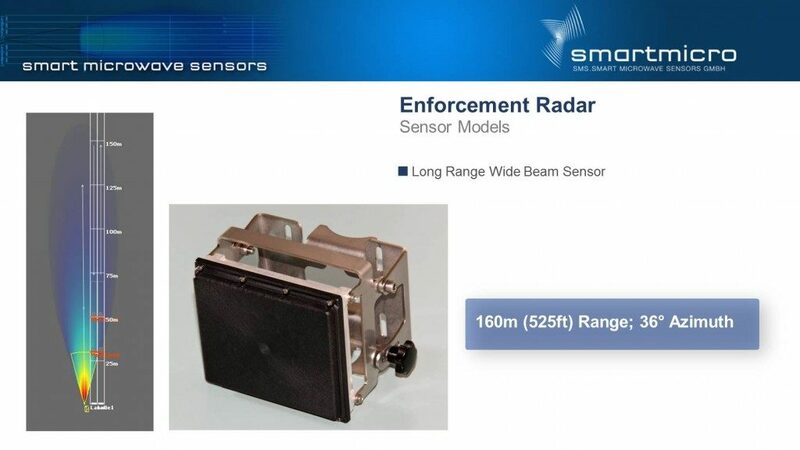 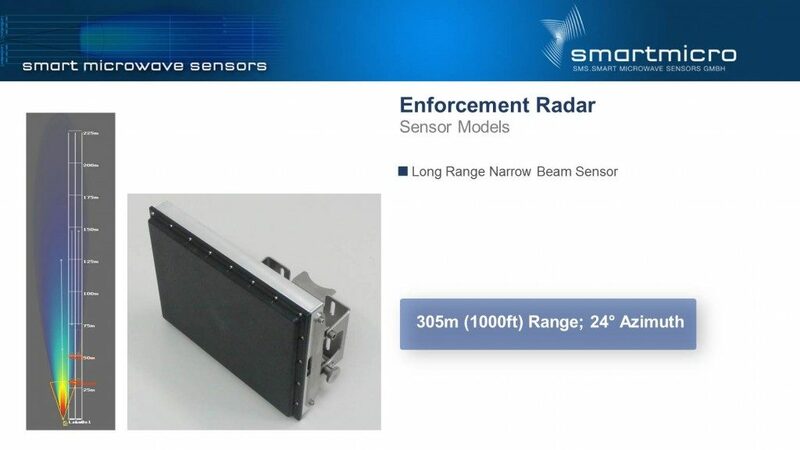 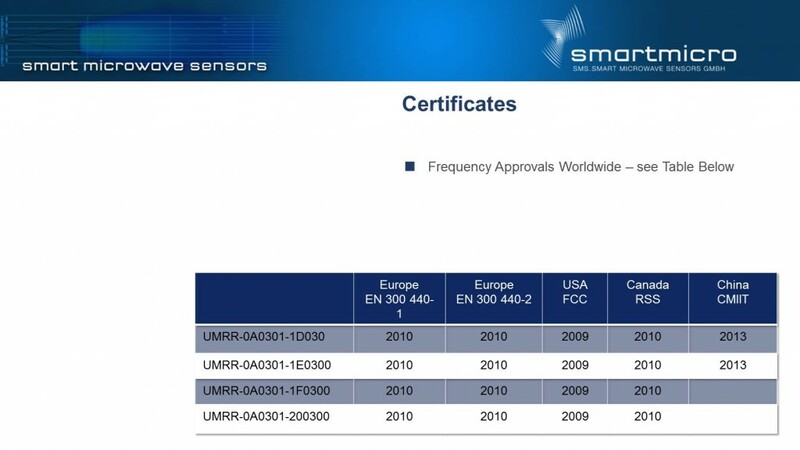 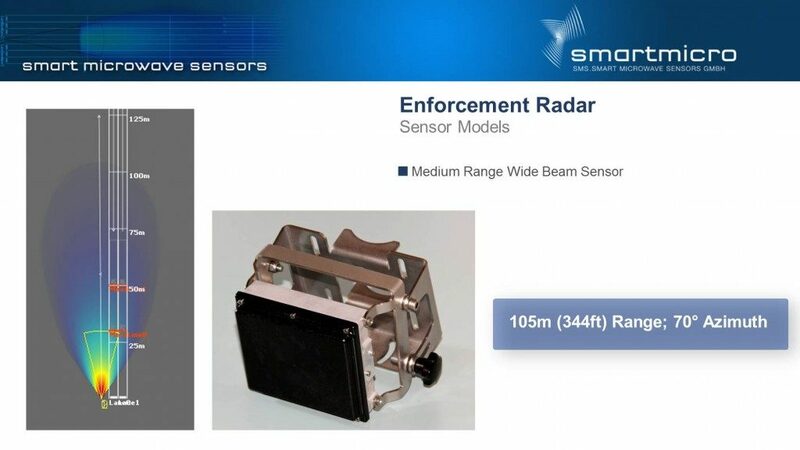 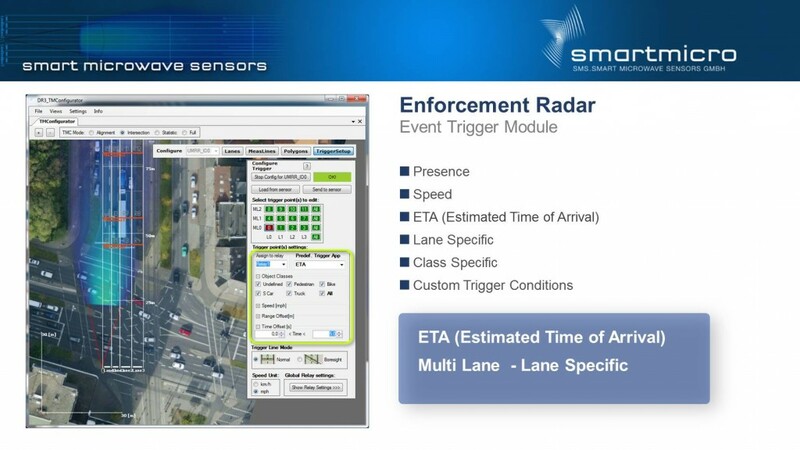 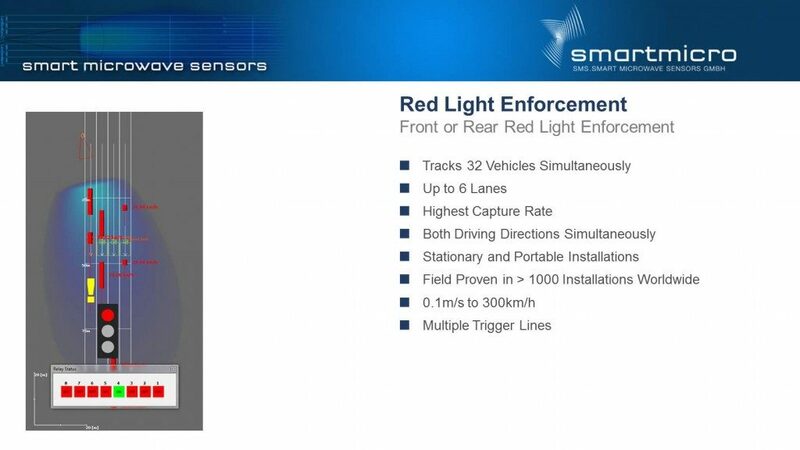 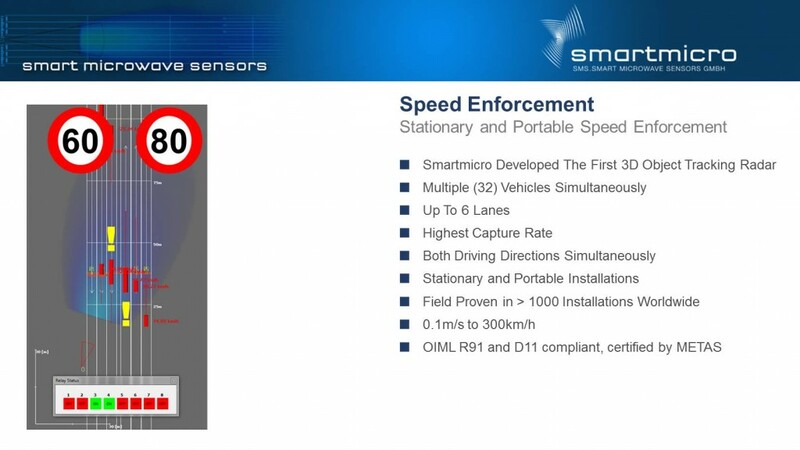 Smartmicro traffic Radars. 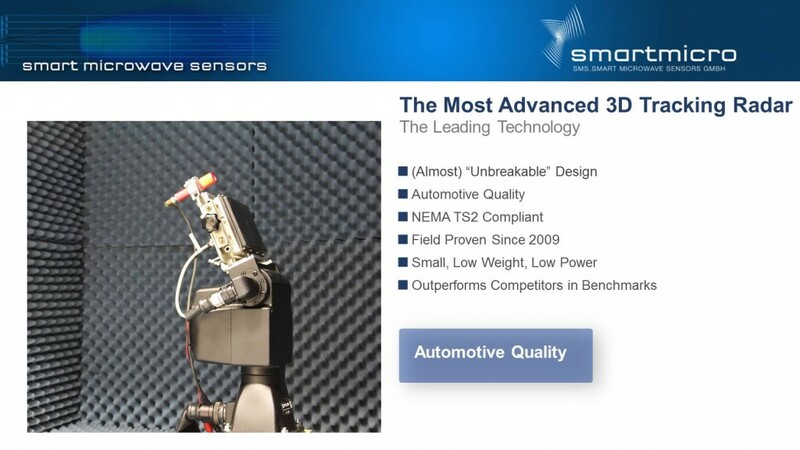 Derived from automotive technology. 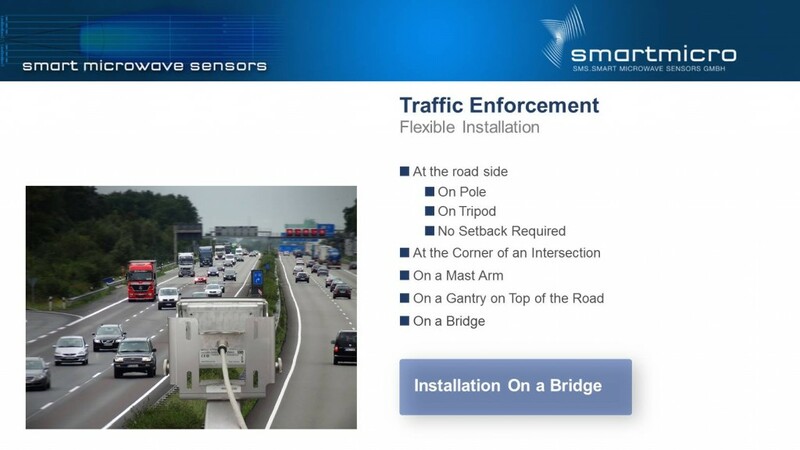 Modular application software design – with this most versatile technology, functions like stop bar detection, advance detection and/or enforcement and traffic statistics can be combined in one sensor if required. 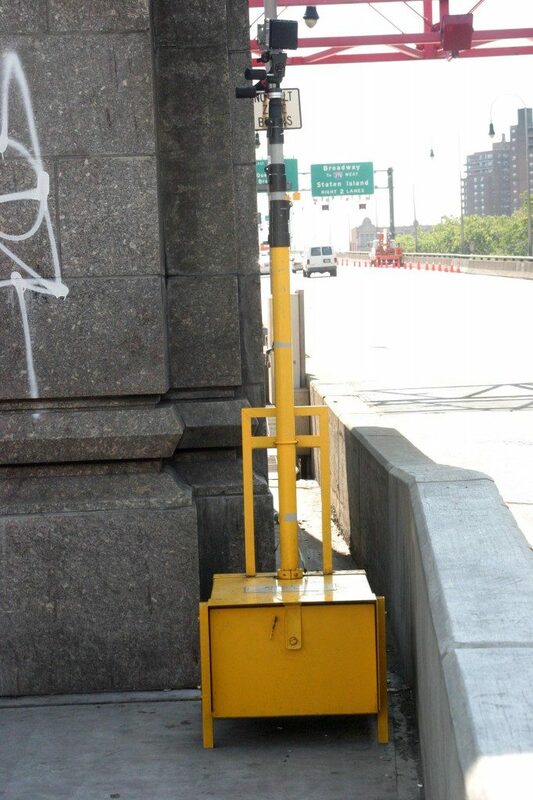 Handles both moving and stopped traffic. 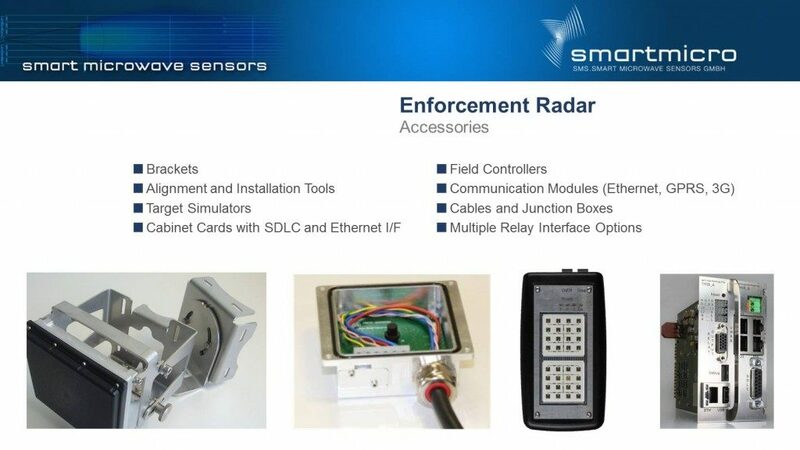 Cost efficient integrated solution (Radar sensor and detection algorithms all in one box) one single sensor replaces multiple other detectors. 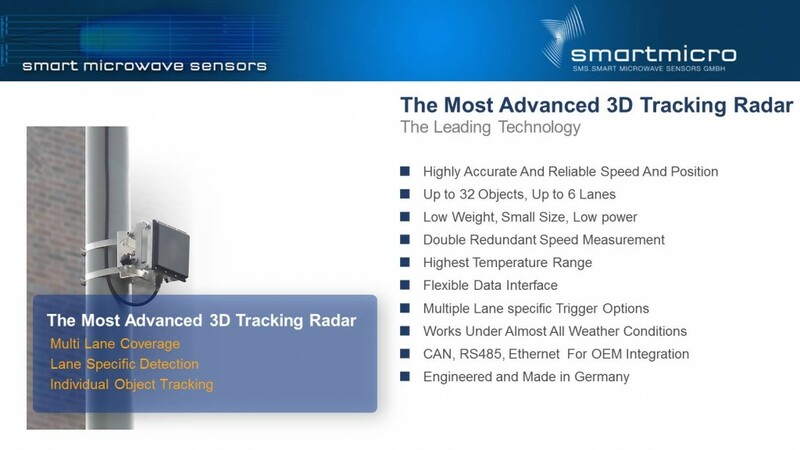 Detects, tracks and classifies traffic (3D object tracking Radar – multi lane traffic detector). 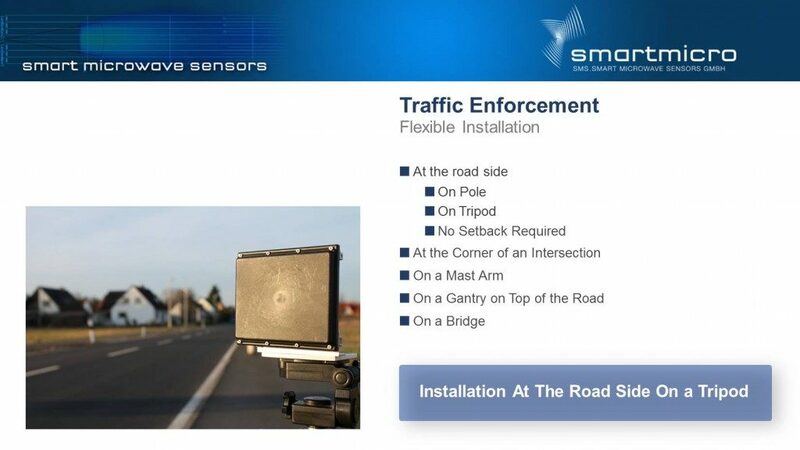 Precisely measures position (x,y), lane index and speed vector for each object. 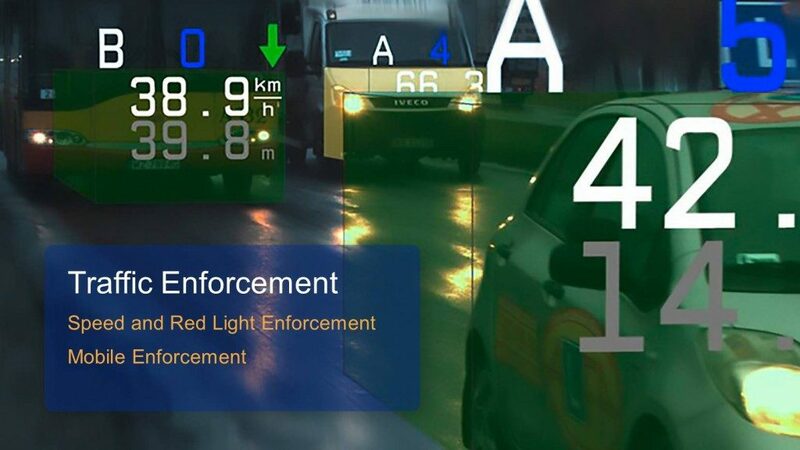 Up to 64 objects simultaneously (trucks, vehicles, motorbikes, bicycles, pedestrians). Operates for 4 lanes (and more) up to 300m (1000feet). 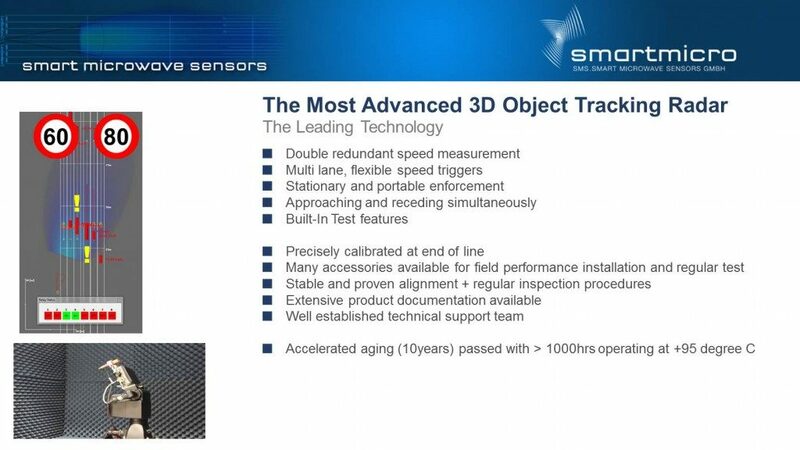 Very precise speed measurement 0.1m/s up to 84m/s (300km/h). 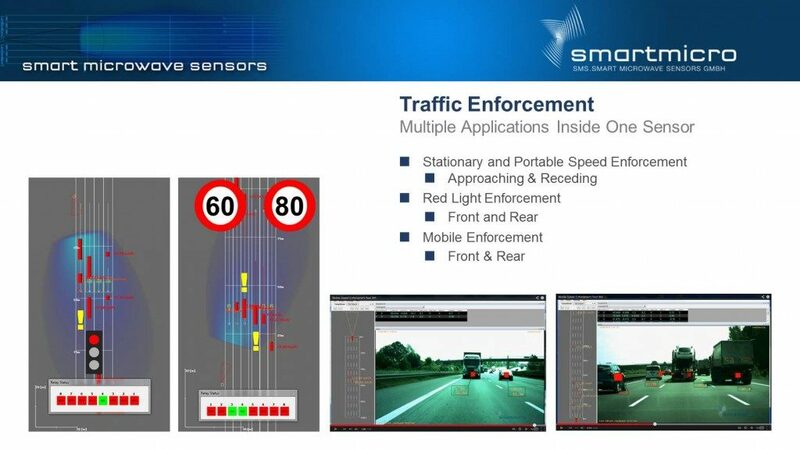 Counting: measures per lane and for multiple measurement lines vehicle volume, occupany, 85th percentile speed, gap, headway and more. 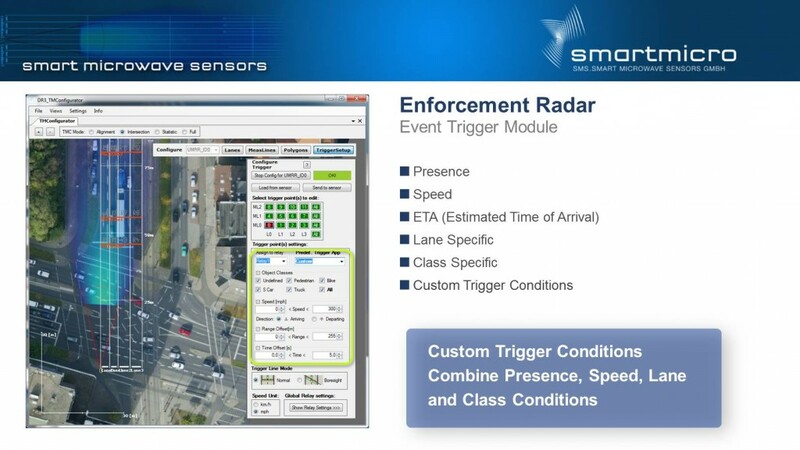 Triggering: event based triggering for presence, wrong way, ETA, speed, queue length and custom applications in user defined zones. 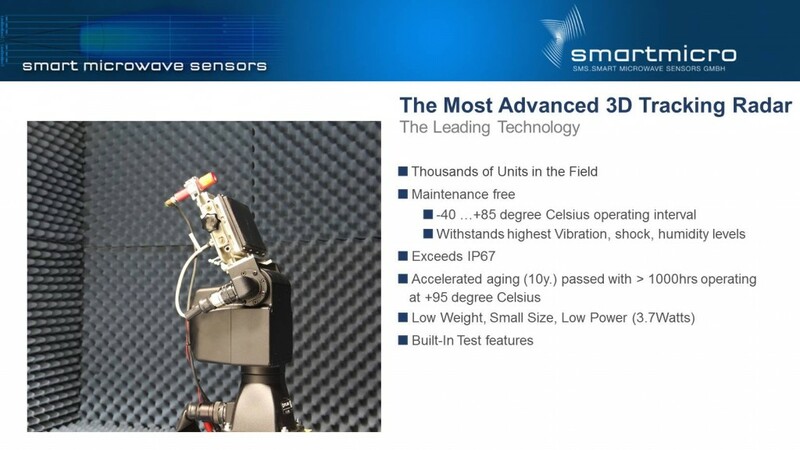 On board self-calibration and diagnostics. 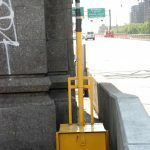 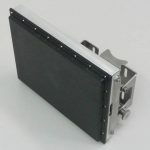 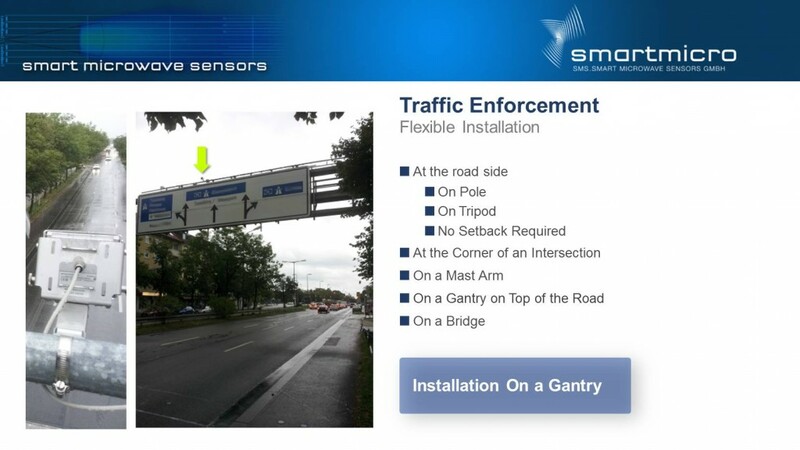 Flexible Installation: at the road side, at the corner of an intersection, on a mast arm or a gantry on top of the road. 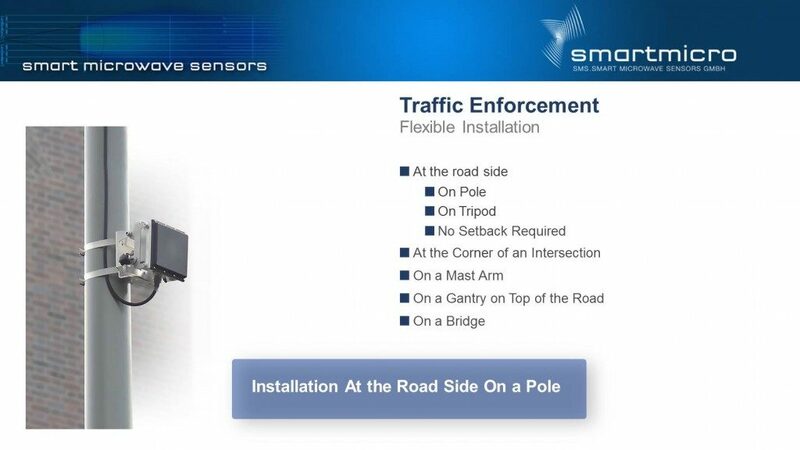 Low installation cost, quick installation and configuration. 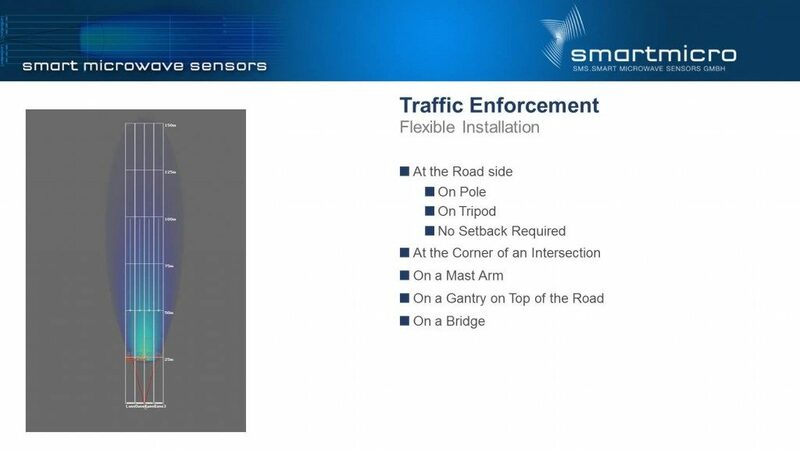 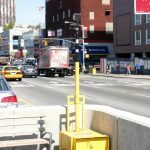 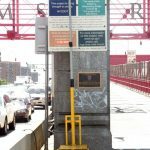 Multiple sensors can be switched together to a network plug-and-play, will work free of interference on a four-way intersection.